What is Cubes & Liquids? consider properties of the cubes and liquids to explain the phenomenon of floating and sinking. Who is Cubes & Liquids for? Cubes & Liquids is a challenging task for graduating high school seniors and engages 6th graders at all ability levels, too. It provides motivation and foundational knowledge related to core scientific concepts and skills. Where did Cubes & Liquids come from? Cubes & Liquids grew out of Inhelder and Piaget’s (1954) developmental studies of children’s understanding of floating and sinking. 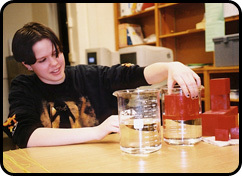 The classroom version was inspired by a laboratory exercise created by Cindy Sargent, a Troy, New York earth science teacher who used the lab to teach density of solids and liquids, careful observation skills and critical thinking. ACASE research on the discovery of scientific concepts by high school students (Zachos, Hick, Doane & Sargent, 2000). Cubes & Liquids is designed for practical use in the classroom. It has been administered to groups ranging from 1 to 60 individuals. It takes approximately 30 minutes to administer and 2-3 minutes per student to rate performance. The ratings then become part of a broad picture of individual student and class performance over time. Worthy learning goals are typically identified by panels of qualified stakeholders (e.g., teachers, educational researchers, scientists) through consensual validation processes and result in documents such as the National Science Standards, the AAAS Benchmarks and various state documents. Learning goals may also be identified empirically (Zachos et al, 2000). Additionally, these learning goals are aligned with New York State Standards for Math Science and Technology. A variety of stories taken from the history of science and civilization might be used to introduce the Activity. Stories motivate students by connecting the activity to real world experiences and to historical figures with whom students may already be familiar. They create a relaxed classroom atmosphere in which the experience can be fully appreciated. The story currently included in the teacher instructions (PDF, 250KB) is the story of how Socrates became a philosopher. This introduces students to a man with a profound bent toward inquiry and to his application and constructive use of the notion of uncertainty. In Cubes & Liquids students will need to consider when there is insufficient information to make a good prediction. The realization that there is insufficient information to make an accurate prediction is a powerful indicator of competence in coordinating mass and volume in conceptualizing density, as well as of the students’ ability to engage in open-ended inquiry. In other words they must discover and become secure, as Socrates did, in the value of knowing when they don’t know. Benchmarks for Science Literacy. New York: Oxford University Press. National science education standards. National Academy of Sciences: National Academy Press. Inhelder, B. and Piaget, J. (1958). The growth of logical thinking from childhood to adolescence. New York: Basic Books. Inhelder, B. and Piaget, J. (1964). The early growth of logic in the child. New York: Basic Books. Zachos, P., Hick, T., Doane, W., & Sargent, C. 2000. Setting Theoretical and Empirical Foundations for Assessing Scientific Inquiry and Discovery inEducational Programs. The Journal of Research in Science Teaching, 37(9), 938-962.